Be sure to order your gift packages in time for holiday delivery. 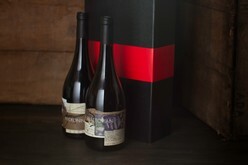 Monday, December 21st, is the last day to ship wine within California to ensure delivery before Christmas. All out of state orders should be placed by next Monday, December 14th. We are happy to help you with your holiday gift list! The gift of wine is always appreciated. We hope to make your holiday gift selection simple and effortless, leaving you time to enjoy the season. We are pleased to offer four gift packages to share with your friends, family and colleagues. We have gift options of limited releases, library releases and current releases wrapped elegantly and delivered on your behalf with a personal note. Shipping within California is always inclusive for ONX Collective Members. You may make your holiday gift selections by clicking here, responding to this email or calling us at 805-434-5607. If purchasing online, be sure to sign in using your member credentials to ensure that your club discount with inclusive shipping within California applies to your order. Also, please select your preferred shipping date and include your personal note. We will take care of the rest. We hope these specially selected gifts will brighten your holiday season.